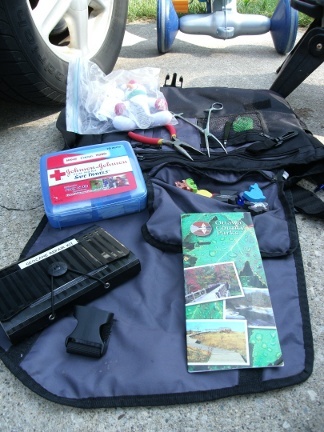 Many geocachers have a bag they take with them while geocaching. Below is a list of what a carry in my bag. It's a messenger bag I found on clearance at Meijer (a Michigan based chain that pioneered the format used by Wal-Mart Supercenters), Originally a $15 bag, I snatched it up on clearance for under $4. For when logs et stuck in micro and nano caches. Many of the parks around me have extensive trails. If the pen fails and pencil breaks Murphy really doesn't like you. Items not pictured but normally carried. If I discover a potential hiding place for a future cache I might place, I jot down the coordinates and check when I get home to see if it is a spot further than 528 feet from any other cache. As a back up to when ink pens don't work-plan on Murphy's Law.